Side view condo located in the Ocean Isle West complex with oceanviews from the porch. Located in an oceanfront complex with access to the oceanfront pool. This 3 bedroom, 2 bathroom condo has new ownership and has been completed renovated in 2015! All new tile flooring, granite countertops in the kitchen, new appliances and flat panel TV in the living room. 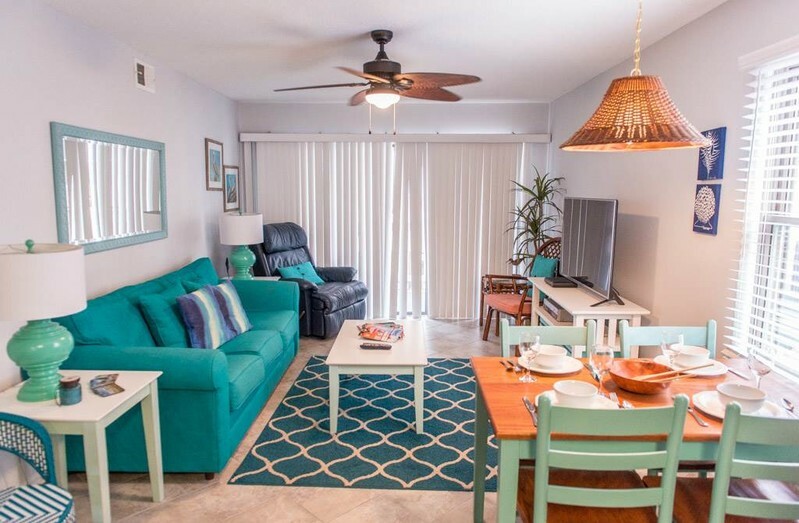 Amenities include fully equipped and renovated kitchen, wireless internet access, dishwasher, microwave and washer/dryer, Large flat panel television in living area, DVD player, cable television in the bedroom, and ceiling fans. Condo has a private balcony- read and relax and catch a glimpse of the beautiful Atlantic Ocean! Keyless entry for guest convenience. Non-smoking, no pets allowed. Sleeps 8 Bedding arrangement: King, Double/Single, Double/Single. I have never been to OIB before. The condo was great. I loved the color scheme. It was well outfitted with plenty of towels, pillows, closet space, kitchenware and the like. The beds were very comfortable. I liked how there were 2 balconies for us to sit outside. I would recommend these condos to anyone looking for a getaway but still have a feel of home. We very much enjoyed or time at OIB. We our condo was very nice comfortable. The weather wasn't perfect but we had ample good beachgoing opportunities. We most enjoyed the small town feel compared to areas that were very coomercial.